Lorenzo was born into a farming family in Lake County, California. He married Mary Louise Williams in 1897 and they came to Riverside about 1902. Scranton was secretary of the Riverside Title Company, whose early slogan was “Safety Plus Service.” Their first office was at 3908 Main Street and in 1917, the firm had a capitalization of $100,000. Other officers were J. A. Sims, president; Charles E. Johnson, manager; and F. E. Densmore, assistant secretary. 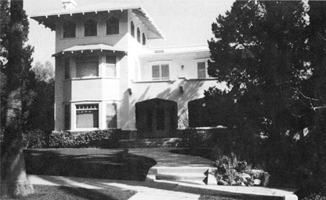 In 1913, Scranton commissioned G. Stanley Wilson to design a three-story, eight-room house at 4595 University Avenue. Charles T. Rice was the foreman for the construction. Six months earlier, Charles Waite, a partner in the title company, had built his “Swiss chalet” style home across the street. Scranton’s home was a combination of Mission Revival and Italianate influences, including a tower with pointed windows and a pointed ceiling on the third floor.